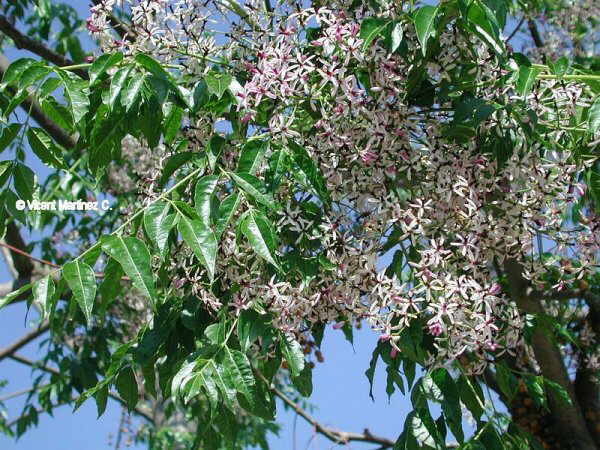 Deciduous tree of the Meliaceae family, up to 15 m. Leaves till 50 cm, pinnate with toothed leaflets. Purplish flowers, grouped in final panicles, with the stamens gathered in a tube, sorrounded by 5 petals. Fruits in drupe, yellowish, still remaining in the tree after the leaves have fallen. Native from the North of Asia,where it climbs almost till 3000 m above sea level in the Himalayan mountains. Adapted in warm places, it can be found in gardens or streets in many cities, specially in the Mediterranian climate.